This picture forms one of the ‘Windsor Beauties’ series, a set of eleven portraits of celebrated women at the Restoration court painted by Sir Peter Lely. The series was apparently commissioned or at least assembled by Anne Hyde, Duchess of York, probably around 1662-5. Pepys recorded on 21 August 1668 that he ‘did first see the Duke of York’s room of pictures of some Maids of Honour, done by Lilly: Good, but not like.’ By describing the pictures as ‘not like’ Pepys is alluding to the often noted opinion that Lely flattered his subjects, and gave each portrait a similar languorous and ‘sleepy eyed’ air, said to have been influenced by the features of the noted court beauty Barbara Villiers, Duchess of Cleveland pictured here. Contrary to Pepys’s assertion, only one of the sitters, Frances Teresa Stuart (RCIN 404514) actually held the position of Maid of Honour in the Royal Household. Some of the others were noted courtesans, while others were respected members of the nobility. In 1674, after the death of Anne Hyde, the pictures were hanging as a group in the White Room at Whitehall which was reported as being 'Hunge wth white sarsanett [sarcenet - a soft fabric, usually of silk], and over it blew Mohair with silk fringe'. Eleven pictures are mentioned in this inventory, although ten today are identified today as belonging to the group. The series was taken from Whitehall to Windsor, presumably by James II and hung in the Princess’s Dressing Room. In the reign of Queen Anne they were hung in the Queen’s Waiting Room and later in the Queen’s State Bedchamber. They were at Hampton Court by June 1835. All appear to be wholly by Lely’s own hand except Anne Digby, Countess of Sunderland (RCIN 404515) which is probably a studio copy. In 1659 Barbara Villiers had married Roger Palmer, later Earl of Castlemaine, although soon after she became King Charles II's mistress, exerting considerable political influence until her fall from favour in the early 1670s. She is believed to have borne him five children and was created a Lady of the Bedchamber to Catherine of Braganza in 1662 and Duchess of Cleveland in 1670. 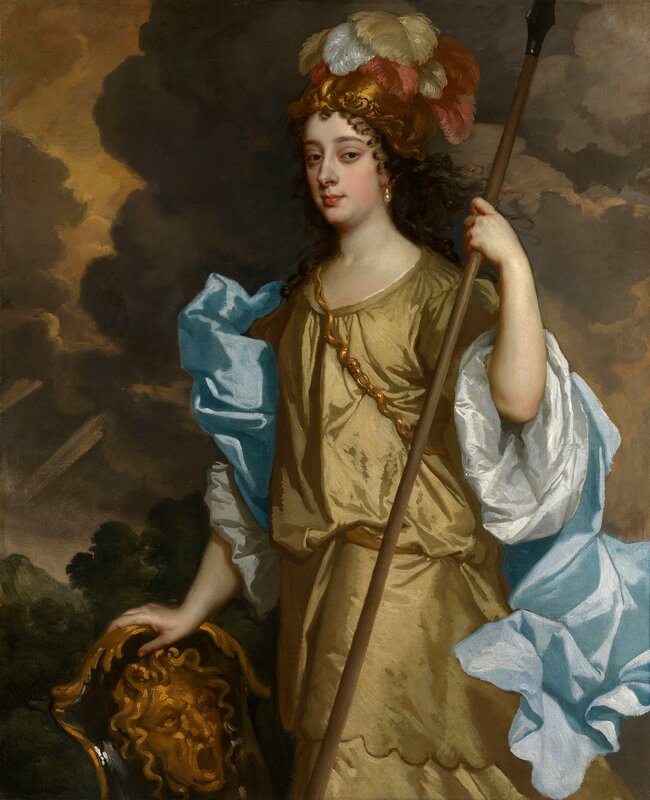 The sitter is here depicted as Minerva, the Roman goddess of war and wisdom. She wears a plumed helmet and holds a spear in her left hand, while her right hand rests on a shield carved with a gorgon's head. The dramatic costume and stormy skies behind heighten the sitter’s calm beauty. Barbara Villiers was painted by Lely on many occasions and in a variety of guises, including as St Catherine and as a shepherdess.